Discussion in 'Epson InkJet Printers' started by DANIEL TORRES, Feb 12, 2019. Looking at options for refilling my P800. I bought my printer late 2018 so I'm sure its fw will block 3rd party carts and decoder board. Has anyone tried the change to Chipless Firmware? Or have an opinion on this. thanks in advance of a response. restrictions, there are refill cartridges with ARC chips offered in Germany. These won't work in other regions where Epson is tracking unique serial numbers on the chips to prevent re-use of cartridges with the same serial number. serial number can be used on different printers. I'm in the US, with the current firmware the printer does not recognize 3rd party carts, same with the decoder board. I'm curious about the website linked, if anyone has tried that option. There are 2 approaches currently offered - the firmware hack to make the printer virtually 'chipless', not reading any chip data at all, and the use of a decoder board which emulates the chip functions and uses different serial numbers after every reset. 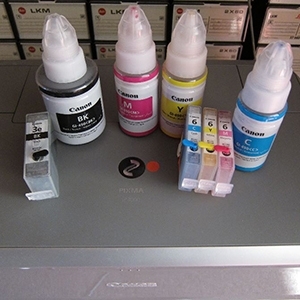 https://www.inkowl.com/wide-format/...cartridge-set-for-epson-surecolor-p800/P8443/ used via a decoder board as mentioned, all that seems to come from China. that a firmware downgrade may not work for all hardware versions of the processor board, Epson may try to counteract against this firmware hack. Where you able to restore your P400 to working order with OEM's after the chipless firmware failure? Yes, the printer is working normally, with regular ARC refill chips.